A little medicine chest in a bottle. I love this soap, and have used twice a day since the day of origination. Have to admit, I a not the most consistent person, but this product, as well as the Lavender Comfort Balm are the two products I use every single day - without thought. I just love the way it makes my skin feel, refreshed & clean. You will feel a noticeable difference in your skin when you use this soap, and on the first application - you will be hooked. A 4 ounce bottle will last up to 3 or 4 months, as just a little dab will do. I have this in every room of my house where there is running water, to wash my hands, as well as I use in the shower. You can add a bit to your shampoo if you have scalp issues and it's also moisturizing. Be sure and read the testimonials on this product and its effectiveness in dealing with acne and other issues. This is excellent to use for wound healing, cat scratches, boils & boils If you have a loved one dealing with ALS and bed sores and dry skin, this is a wonderful product. I have a customer who has had a colostomy who cleanses with this soap and has not incurred any infection. 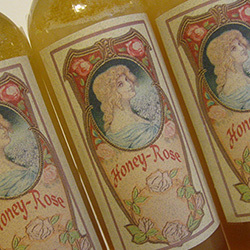 Honey is a miracle product and withdraws the moisture out that bacteria needs to grow in. I also use this on my animals when necessary, and just recently sent a large bottle to an animal rescue group to deal with an animal with severe scabies and mange. Use less than a dime, apply water, clean skin well, and rinse well. 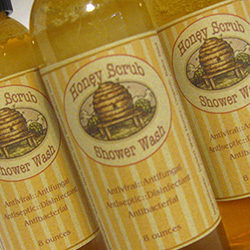 An antibacterial scrub with Tea Tree & lavender, this wash has antiseptic and fungicidal action. Apply a small drop on a pimple or boil, and leave on (is transparent) and will speed the healing and clear infection. Apply to warm wash cloth and use for a face pack when cold season arrives. This powerful punch in a bottle will last about 3-5 months on the 4-oz size. This face wash is excellent for all skin types. 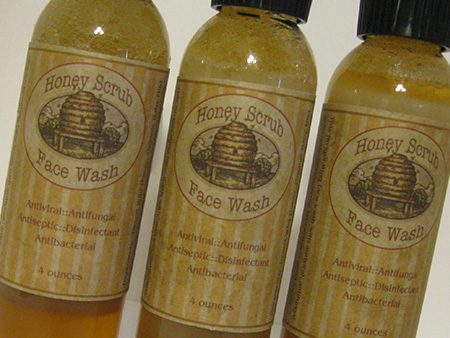 Ingredients: Desert Wild Honey, Baby Mild Castile Soap, Tea Tree, Lavender, Rosemary with Olive Oil, Coconut Oil with Vitamin E.
Subscribe to the Planet Earth Monthly Newsletter for Specials - Product News - Recipes & More! MEDICAL DISCLAIMER: The information presented in the Planet Earth Remedies™ website is not in any way meant to be a substitute for medical care or advice from a physician or health care professional. As with any product, discontinue use immediately if you experience any adverse reaction. Our products are for external use only. No medical claims are made or implied, this information is not intended to be used to treat or diagnose any condition. If you have medical concerns or questions please consult your physician. copyright 2005-2015. Planet Earth Remedies. All Rights Reserved.